Green Reading is tricky - or let us say it used to be tricky! With the Absolute Reader you will dramatically improve your ability to read greens. Imagine being able to see the line between your ball and the hole. Work with the Absolute Reader and you will clearly see how much a putt actually breaks. Professional players and teachers are amazed; we know that you will be as well! Put it on the green and aim it towards to point you think is correct and hit the ball. The Absolute Reader shows you exactly where the ball would go IAS IF you hit the putt exactly where you have the track aimed. Even if your stroke isn't perfect the Absolute Reader will straighten the ball's path out so you can see if your guess on how you read the putt was correct. Practice with the Absolute Reader and you will find downhill, breaking putts easy to make! When practicing green reading you have to be sure that the ball starts on the line where you are aiming. The Absolute Reader is a green reading tool where the ball always comes out straight, no matter how you hit it. There are tools on the market where you can drop the ball, like a Stimp-meter, but this is not the same as hitting a putt. 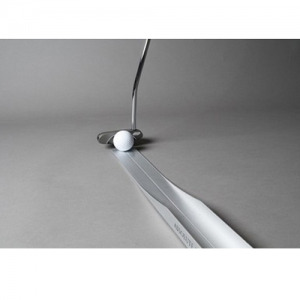 By hitting the ball with your putter, you get the feel for the proper speed of a certain break and the conviction to commit to stroking along the intended line. You can also hear the sound of the ball wobbling if you don't hit it straight through and that tells you that you may have subconsciously compensated for a line that you did not believe in. The Absolute Reader presents a new way of practicing putting where the feedback you receive regarding your aim-ine is absolute! If you have any questions regarding the Absolute Reader Golf Putting Aid, please give us a call, we would be happy to help you with any questions you may have. Write an online review on the Absolute Reader Golf Putting Aid, and share your thoughts with others.